MESH makes it really easy to create docs. 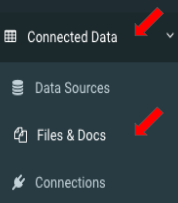 To access your docs use the navigation menu on the left click Connected Data, and select Files & Docs from the drop down. You will be directed to a docs listing screen that shows all available docs. You can sort the docs or filter using the search box. By default, any archived docs will not show. You can display these by clicking the 'Show Archived' box in the top right corner. To create a new doc click ADD NEW+ in the top right corner. You will then fill out the necessary fields including Name, File Name (if any), an Icon and description. Then click CREATE DOC+.